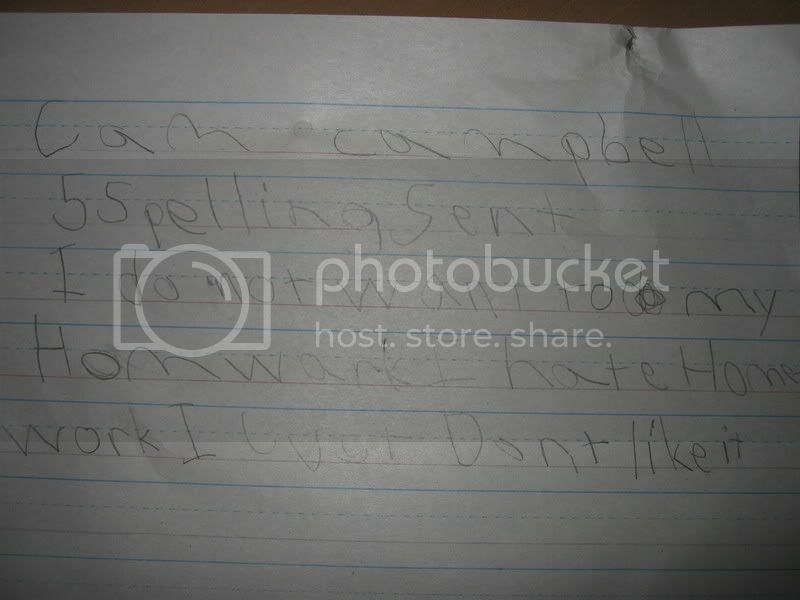 My son Cam is in 1st grade. The homework load is brutal for little guys. Probably more than I had in 4th grade. Anyway, on Wednesday his assignment is to write 5 sentences of his choice. He's a good kid and top student, but brutally honest and frank. I wonder where he gets it? I think he should get an A. What do you think? It's not school I hate, it's the Principal of the thing! 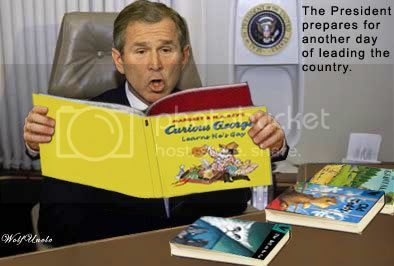 Hey, even the prez has homework. Here he is studying for his reading test. Maybe your son could tutor him. Sister Mary Francis would have broken me down like a two piece shotgun if I wrote that in first grade. Catholic Nuns....I still fear them. once i got into the 10th grade i only did homework if i absolutely had to. Yeahhhhh Budddyyyy. How many margaritas will it take to race me down the water slide? Hi teacher is a screaming beaaaaattttccchhh from Mass. She is gonna love it. Kids say the Darnest things, But when they are that age, they say whats on their minds. Thats Priceless, Be sure to let us know what the teacher said. That looks just like my homework except his handwriting is neater then mine. Though when your in college as an engineering student, the professor will usually take off lots of points for showing all your math work and citing sources. What's a catholic nun? We don't have those down here. I remember report card day like it was yesterday Sister &quot;Mary Francis&quot; the principal, would come in with the class report cards and call you up to the front, one at a time. Depending on the contents of said card, you got something ranging from a grudging &quot;keep up the good work&quot; to an absolute public humiliation. TB, your scaring me. My boy has word problems and basic algebra in first grade. Yikes! "Dad, can you help me with my homework?" My kid is in Kindergarten and has 1 hour of homework every night!! !